During the years 15 AD to 26 AD, Valerius Gratus was the Roman Procurator. Then Pontius Pilate succeeded him in 26 AD as the Roman Procurator to govern Judea and Samaria, and also administer the province of Palestine (the most difficult province in the Roman Empire). The fifth governor of Judea after the Augustus Archelaus, Pilate was a well-educated man from the middle classes. According to the apocryphal gospel of Nicodemus, his wife was Claudia Procula. However, we are not sure that she belonged to the family of Emperor Augustus. Apparently, his wife urged him to say during this praetorium (Matt 27 v 19). "I had terrible nightmares because of that so called 'just man'". Dreams were very important to the Romans, who saw them as warnings from the gods. His mother-in-law led a debauched life in Rome, and in 26 AD Pilate was appointed Imperial Procurator of this distant Eastern colony; this was usually the kind of post given to someone whom one wanted exiled from Rome. Was this appointment connected to his mother-in-law's behavior? As soon as he arrived in Cesarea, he ordered his soldiers to install statues of the Roman Eagle in Jerusalem and also some of Tiberius. When the people rebelled against the effigies, he immediately took them down. Often he clashed with the ultra-outlander Jews who hated the Romans and their paid mercenaries (who were often more cruel and harsh than the Romans themselves). This hatred was reciprocated; the Romans never accepted meat from the Jews for fear it might be poisoned. The Jewish historian Flavius Joseph told that one day Pilate, noticing the lack of drinking water in Jerusalem decided to build a huge aqueduct comprising 40km of water channels from the mountains to Jerusalem. This idea would have been acceptable if only Pilate had not decided to take the funds necessary directly from the temple treasurer! The people revolted and the army had to intervene. Many Jews died in the fighting and others were crucified. Pilate never forgot the man whom he had "condemned in spite of himself". "This man who had intrigued him and whom he had so much wanted to save from the grip of the hoards of blood thirsty wolves", this poor "worker of miracles" whom the secret police had praised so often. He was no fool and understood the game of turning him against this easy prey, who was faultless and vulnerable! They were all full of hate....they who only spoke of God! So he told them to write in three different languages "Jesus of Nazareth - King of the Jews". This happened three days before Passover. All the Jews coming to Jerusalem to celebrate the Passover were astonished to see this sign over Jesus' cross. I am a King, but my kingdom is not of this world. What is truth? In this world of intrigue and insensitivity, where the law which governs is that of brute strength and evil intentions. Let us not forget the terrible plot in AD 29 when the Empress Livilla wanted to put her lover Sejan on the Roman throne instead of Tiberius. Even the life of a Roman Emperor was not worth a great deal. If he did not fulfil his mission, he could be dismissed the same day and sent into exile. Vittelius dismissed Pilate and sent him to Rome to vindicate himself before the Emperor. However, Tiberius died before Pilate reached Rome and it was Caligula, the new emperor, who judged him and condemned him to exile in Gaul. Eusebius states that he committed suicide. Others claimed that he became a Christian and was perhaps even killed as a martyr? Often criminals were tortured on a promontory just before the main entrance to Jerusalem, so that this would deter any who were contemplating Roman Laws. There were 300m between the governor's palace and Golgotha, (the hill in the shape of a skull where those condemned to death were tortured). 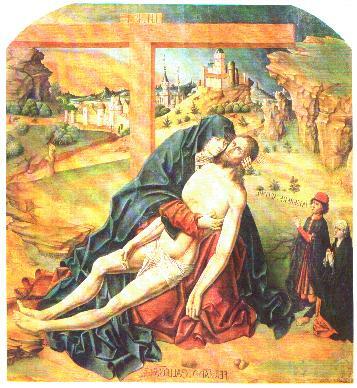 Usually the condemned man was made to carry the wooden cross piece over his shoulders to the place of crucifixion. But Jesus, who was exhausted from his floggings, fell down three times, his blood soaking his robe. The Jews asked the centurion if Jesus could have someone to help them carry the cross, as they feared that Jesus might die before His execution. The job fell to Simon the Cyrene, a robust peasant farmer. When they arrived at Golgotha, they offered Jesus a drink which would help Him bear the pain, but He merely sipped it and then turned it away. They took off his garments and nailed him to the cross. He made no sound as they hammered in the nails; one after the other.....into His hands and feet. Ha! He saved others, so if He's the Christ, let Him save Himself!! I promise you that truly this day you will be with me in PARADISE. Mother, here is your son. John, this is your mother. From that moment on, John took her to his house and took care of her. Matt v 46: "My God, my God, why have you forsaken me?" Luke and John: "Father, it is done; I give my spirit into your hands." Having said that, He gave up His spirit. Matthew, Mark and Luke mention the darkness falling and the veil of the temple split down the middle. Matthew adds that the earth shook and that the saints were resurrected. However, John, an actual witness who stood beside Mary, only talks of a great silence. John 19 v 31. So that the body would not be on the cross during Passover, the Jews asked Pilate if the soldiers could break the legs of the three criminals and take down their bodies. The soldiers saw that Jesus was dead and did not break His legs, but pierced his side: blood and water flowed from the wound. Luke 23 v 50. One of the seventy members of the Sanhedrin, because he was just and fair, had not condemned the Nazarene He was called Joseph of Animathea, and he too waited for the Kingdom of God to come. He was an elderly man disappointed by the attitude of his colleagues. He went to the governor's palace to ask Pilate's permission to take Jesus' body to be buried in a new Sepulchre built out of the rocks, which Joseph had prepared for his own burial. Pilate gave him permission so he went to get Jesus' body and wrapped it in a white shroud. Nicodemus went too, carrying a mixture of about 100 lbs of mirrh and aloes. 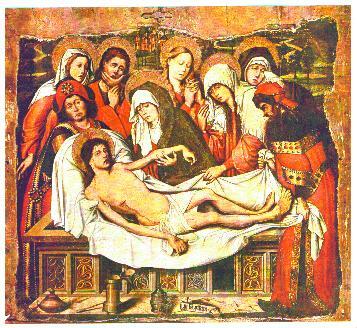 They covered the body of Jesus in bandages and linen wrappings soaked in the perfume of Myrrh and extracts of Aloe, as was the Jewish custom. Then Joseph rolled a huge rock in front of the entrance. "We remember when this 'imposter' was alive". He said, "After three days I shall rise again". Would you please have the Sepulchre well guarded until the third day, so that His disciples cannot take Him from the tomb and claim He has risen from the dead?" This was yet another potential insult to Jesus and His disciples. You will have a guard; guard Him as you will. At this, they went to the tomb, made sure it was well sealed and saw that a guard was there. Each year Mary went to Jerusalem to celebrate the feast of the Passover. Usually she stayed with her family, probably with her sister (who in our language was probably her cousin) the wife of Celopas, who was mentioned both by John and Mark as the mother of the younger James. - They came with a huge army... they arrested Him. Mary, His mother, did not utter a word but huge tears ran down her cheeks. At daybreak Peter arrived crying and yet very angry; he was both shocked and upset. He shook his head and could not control his emotion, he the mariner who had bravely survived tempests! He could not believe this betrayal by the Jewish leaders who were totally devoid of feeling. Everyone dressed in haste and hurried to the place where the Sanhedrin usually met beside the temple. The sun rose behind the mountains of Judea, but on that day there was an air of intrigue and treachery hanging over Jerusalem. The heavy gates of the palace of the Sahhedrin opened and Jesus could be seen guarded by a large group of armed soldiers, who were marching to the Roman Governor's palace. Behind them were about 20 pharisees and priests in their fine robes, accompanied by their servants. They waved their arms and were very satisfied with the outcome. According to JEWISH LAW, entering the palace of the palace of the Roman Governor would make them unclean, and there would be not enough time left to be purified before Passover. The small group of the prisoners' friends were led to one side of Pilate's praetorium. Now everyone was waiting to hear the Governor's verdict. Pilate entered his praetorium and left again; he was not convinced that Jesus was guilty. Then the soldiers took Jesus to Herod Antipus; from there He emerged an hour later dressed in the white robe of innocence to be returned to Pilate. He still had the leaders of the temple following Him, but this time they looked angry and complained of the injustice in this land! Soon Jesus' family arrived accompanied by the nine remaining disciples. They were all overwhelmed by the news. Up above on his balcony Pilate suddenly asked the crowd to choose whom he should set free in honor of the Passover: Barabbas or Jesus? The small group shouted as loudly as they could: "Jesus of Nazareth!" But they were outnumbered by the rest and it looked as if the latter had been well prepared for this by the Sanhedrin. When Pilate announced that Barabbas would be released, a shout of reproach came from the small group of those loyal to Jesus. They were appalled that an assassin would be set free instead of an innocent teacher who had performed so many miracles and healed so many people. Two more hours passed and finally Jesus came out of the praetorium with the Governor. He was barely recognizable, His head was covered with blood and His group of followers screamed with horror when they saw His back too running with blood from the repeated beatings. But this was not enough! The priests would have Him dead. They shouted at Pilate (who had been trying to defend Jesus until now) "Crucify Him!!" Pilate finally gave in when one Jewish priest accused him of being "A friend of Caesar." Pilate was quite worried as he knew that the Jews had "brothers in high places in Rom", even in the immediate entourage of the emperor. 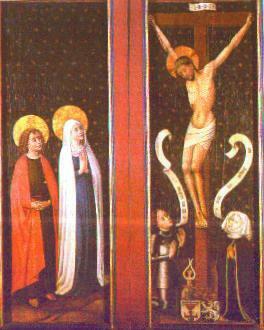 She followed Jesus as He walked very slowly dragging the wooden cross piece behind Him. The soldiers would not allow her to get too close to Him, even when He fell to the ground three times from exhaustion. Finally they arrived at the place where crucifixions were performed. Mary would never forget the sound of the hammer banging the nails into her son's hands and feet. How could the men be so cruel? Why did the ministers of the temple want to hurt Him so much, He who had helped so many? 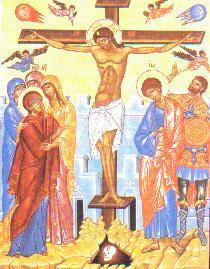 When the cross of Jesus had been set up between those of the two thieves, the family was allowed to approach Jesus. Mary, her cousin, John, and Mary Magdalene crossed through the line of soldiers and stayed hear to Jesus in his hours of agony. Mary was suffering the ultimate sorrow; her only son was dying slowly before her eyes, and she could do nothing to help Him. She stood near his feet which were running with blood. She kissed His feet and washed them with her tears, but even as she did so, she was afraid she might cause the guards to hurt Him again. The wait was endless, unbearable. She hardly noticed when Jesus asked John, (the disciple whom He loved) to care for His mother for Him. John held Mary close to him, just as Jesus had done for him in their childhood. John wiped her tears and she rested her head on his chest. She did not see the soldier pierce Jesus' side, or see the mixture of blood and water which gushed out. It would have been more than a mother could bear. You (His mother) will feel a sword pierce your soul. The prediction had been fulfilled. Finally He died and all her grief, her cries and shrieks of pain could be expressed. All her cries mingled with those of the other women around her. The soldiers took Jesus down from the cross and pulled out the nails. For the last time Mary held her son in her arms. She had carried Him for nine months with such joy, declaring herself to be the "servant of the Lord". She pressed her cheek against His as a sign of "Farewell". Then, obeying the laws of the Sabbath (which required no work to be done after sunset on Friday night), she allowed the men to carry His body to a new Zepulchre nearby, one owned by Joseph of Animathea. Mary left then, partly carried by her friends. Her heart was broken by the cruelty and inhumanity of men. She had given ALL that was precious to her, and she also had traveled the long painful way of the cross. When we read the message of Jesus' life, His teachings, His parables and miracles, we are amazed by the gift of love which came down to us; Jesus and His mother made the supreme sacrifice. When JESUS died, Mary probably was about 52 years old. According to John, she lived for another 10 to 25 years within the growing church and one day in Ephebus in Turkey, she died in her sleep, leaving earth where she had suffered so much and ascended into heaven. Jesus told that He had been born before Abraham and had "come from the FATHER" to accomplish His work, we can only surmise that Mary too, the mother of the Divine Son existed before the creation of the world. Since the time of GENESIS, she had fought the evil serpent. After her death, when she appeared to children as a woman of great beauty, bearing messages for people all over the world. Who truly knows (apart from Jesus and His disciples) about Eternal Life? It is a world full of mystery, and not just a place of constant vacations where one wastes time between eating, drinking and sleeping! The images of the Virgin and worship of Motherhood are very ancient concepts and though we know very little about ancient civilizations (some of which were probably more advance than ours! ), we have found in the south of France and in Turkey statues of a Mother - Goddess over 22 000 years old! She protected the homes and aided the sick, woman and children. Is it only coincidence that the SIGN VIRGO in the stars has been known by us on earth for thousands of years and that its appearance coincides with harvest time? Also amazingly, the sign GEMINI appears exactly nine months after the sign of the Virgin becoming mother!
" Love - Protection - Food and Rest "
Love: Is there a better symbol than the love given by a mother to her child or a woman to her husband? Protection: Have we not seen that a mother having carried her child in her womb, close to her heart, thinks only of defending him or her, sometimes sacrificing her own life in so doing? Food: A baby's first food is its mother's life-giving blood and then her milk. For many years she carefully tends her children until they can care for themselves. Rest: Psychologists agree that the most beneficial position for sleep for children and adults alike is "the fetal position". One lies usually on one side with the legs bent and the head learning forward. They claim that the subject is more relaxed and their sleep is healthier and more restorative. One night Jesus said to Nicodemus: "If you do not become like little children, you will not enter the Kingdom of Heaven. Let us think about the purity and innocence in the hearts of children. They have great trust and wonder; they love unconditionally and run instinctively for protection to their mother's arms whenever they are afraid. Jesus gave His mother to us from the cross. She was a model of love who had fed, protected and loved Him so much for the thirty years He spent on our small blue planet where humans also stay for such a short time. When He said to Mary and John, "Mother here is your son", it was to ALL the children of the EARTH who needed protection and had an open heart (like John) that Jesus gave a mother; to all children who suffer, and especially to those who are alone, or orphaned and live in terrible poverty. Genesis 3 v 15 - "I will put hatred between sinners and the descendants of the Son of God. They will crush your head and you will strike his heel". This predicted from the beginning the relentless combat between good and evil. In our modern world which seems to be like an ocean of tempests, selfishness and cruelty, Mary comes each night as the North Star which shows the wanderer a guiding light which will soon allow him to return to a friendly haven.
" Mary remains the eternal mother who helps ALL CHILDREN." "There is nothing more beautiful than the love of a mother, each child has its share and it is ever abundant". It is said that a mother is more attentive to their children's problems than is the father. They pardon small mistakes very easily as their hearts are more tender and loving. So be ever so grateful for your mother's love, so that you may pass this gift on to others. Also, talk to Mary just as a child would open his heart to his mother. Trust in her because she has much power and grace to bring to us from God; She will also intercede for us with her Son.